Bear with me while I recount some frustrating experiences before I get to the good stuff. Yesterday we were out almost all day. I generally prefer staying in most of the day on the weekends, but we had a few errands to run, and my son had a gift certificate for Toys-R-Us that we were determined to use. So, out we went. First we stopped by Target looking for a few medications for our allergy-stricken little girl, and an arm sling for my wife (who has a pinched nerve in her rotary cuff, or something like that). Target was frustrating. Their level of customer service is beginning to sink to Wal-Mart’s abysmal state, and for some odd reason they were packed with hundreds of rude, hurried individuals. Plus, we needed to have some questions answered by a pharmacist, but they only had one man behind the pharmacy counter, and he was more interested in chatting with some friends who were hanging out by the counter than he was in helping the ever-growing line of customers waiting for him. Eventually my frustration crested, and we left in a hurry. That’s when I noticed that my irritation with Target was being amplified by a nauseating hunger. Our next stop was supposed to be Wal-Mart to try their pharmacy, but that was looking less appealing by the second. While I just wanted to get it over with, we decided that our whole family was just going to be cranky and upset until we got some food. Our whole family loves Panda Express, and there was a good location in the same general area as the Target we had just fled. I say it is a “good location” because there is another Panda Express closer to where we live that serves sub-standard food. It’s a shame, really, that one of my favorite restaurants can’t keep their food at a consistent quality. When it’s made well, it’s really good. When they just don’t try, it’s pretty nasty. Unfortunately, the parking area around the “good” Panda Express was full. Not a single parking spot within walking distance of the restaurant. By this time, I had already decided that I would prefer something with a drive-through anyway, so we decided to look for a Chick-fil-a that we had been to in the area once before. About five minutes down the road we pulled in and got in the drive-through line. As it happened, the line was long and moving slowly. To maximize our efficiency, I decided to let my wife move to the driver’s seat so I could jump ship and run into the Rite Aid pharmacy located conveniently next-door to the restaurant. Inside I waited around a little before being helped by one of the two available pharmacists. She was very kind and extremely helpful. We found some good medications for my little girl, but they were all out of arm slings. She warmly thanked me as I walked away toward the registers with my medication. That pharmacist had nearly healed me of the Target incident, but my experience with their cash register operator was not so positive. The only words he exchanged with me were, “I can help you over here,” which he rudely interjected into his conversation with another employee. He didn’t look at me, he didn’t bother ceasing his conversation even a little for me, and I walked out wondering if customer service was completely dead. Several years ago, while working for a major national bank, I was put in charge of increasing our team’s customer service skills. I was told to read a little book called “Raving Fans” about customer service. I highly recommend this book to anyone, not just those who run businesses. Anyhow, that book forever changed my perspective on customer service. Inside, the authors point out that good customer service is very much a dying art. On this Saturday afternoon, that point was being driven home straight and true. Just as I was exiting the store doors, I saw my wife getting back into her seat in the car, which she had pulled around to the Rite Aid parking lot. When I got into the car, I noticed a sharp contrast between the way she was feeling and the way I was feeling. I had thought she would have been more frustrated than she was, because she had just waited in a long, slow-moving drive-through line. However, she was smiling, calm and relaxed. This is very unusual for her after having to wait in a car full of frustrated, hungry children. What had happened? Chick-fil-a had saved the day. I have been to several Chick-fil-a stores all over the county (as far as their boundaries allow), and I have never, not once, had a poor customer service experience there. Whatever they are doing, they are doing it right. Of course, I’m not alone in recognizing this. Every Chick-fil-a I have ever visited has had the most friendly, attractive and competent people working their registers. They have extremely high standards in customer service, food quality, restaurant appearance and much, much more. Of course, they aren’t perfect, but I am not aware of another fast-food chain that comes even close so consistently. Sure, some restaurant locations come close or even surpass this standard, but never have I come across such a large chain that is able to apply the same high standard over so many stores. While I do not know exactly how everything prior to our arrival at this particular store played out, here are the facts mingled with my speculation. Sometime prior to the lunch rush on this hot Saturday afternoon, the employees at Chick-fil-a on the Crain Highway in Waldorf, Maryland realized their drive-through intercom system was not working properly. I do not know if anyone panicked, I do not know who coordinated how they would handle the situation, but I do know that they came up with a perfect plan, turning rotten circumstances into a great opportunity to show their customers how much they care. After I left my wife in the driver’s seat and ran off to the drug store, and before she even made it to the menu board with the broken intercom, she was greeted at her window by a knowledgeable, smiling young man in a Chick-fil-a uniform. He was equipped with laminated menus for the customers to look at, but my wife didn’t even need one because every question she asked about the menu or her available options was answered quickly, naturally and easily by the smiling young man. At some point during their wait in line (either before or after their order was taken) an employee came by offering my wife and children a free sample of milkshake (or some other appropriately cool treat to help fight the heat). By the time she made it to the window, she simply handed her preferred method of payment over to another smiling employee before receiving her hot, fresh, excellently prepared food. Every employee displayed the best possible attitude, every employee did their job expertly and with a smile, and not one of the customers felt inconvenienced by the broken intercom. In fact, in many ways it seemed to my wife that they were actually operating their drive-through more efficiently without the intercom than if it had been working properly. As my wife related all of this to me, I was brought back to the many times I had encountered broken intercoms at other fast-food restaurants. Usually, I was greeted at the broken intercom by a weathered paper sign duct-taped to the broken speaker telling me to pull around to the window. The employees inside were frustrated at their misfortune, and the customers were all irritated at the inconvenience. I have even worked in fast-food restaurants, and I have worked in the drive-through while our intercom was unusable (what is it with those things breaking so easily?). I remember trying hard to keep a good attitude and be patient with the understandably irritated customers, but I never would have thought to turn the event into a positive experience for our customers. I must say, Ken Weikel (the operator of that particular Chick-fil-a store) has an outstanding crew working at his location, and I hope they are all lavishly rewarded for their genius customer service performance on Saturday, April 17, 2010. I will never forget it, and I know my wife won’t either. Now, if only all of the other restaurants in the world could take a lesson from this. You see, it isn’t impossible for fast-food chains to find good people. Any business that serves customers should invest heavily in finding the best people to face those customers. 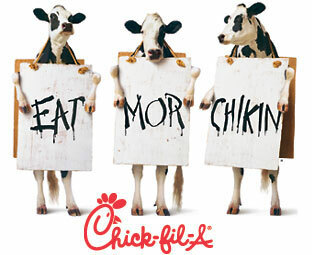 Given the choice between Chick-fil-a and McDonald’s, I will always choose Chick-fil-a because I am important there. I have a very similar experience every time I call my insurance company, USAA. Someday, if I ever own, operate or start a business, I hope I can find people as good as those that USAA and Chick-fil-a have found. We did finally make it to Toys-R-Us where our customer service experience was largely neutral, but the nice young lady who did the check-out did have pretty good customer service skills, so I’m not complaining.